Three sisters have become the first set of triplets to be offered places at Cambridge University. 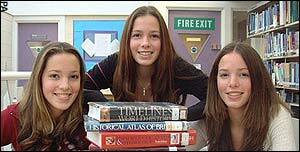 Lil, Helen and Kate Armstrong, 18, from Truro, Cornwall, have been given conditional places to read medicine, law and natural sciences. Currently studying A-levels at Truro College, they must each achieve three A grades to confirm their places. The sisters say it was a coincidence they all applied to Cambridge. They have received offers from different colleges - Selwyn, Corpus Christi and Trinity Hall. Lil said: "We are very nervous about just one or two of us receiving an offer but once we realised we all had a conditional place it was a very big shock as well as very exciting." Tim Armstrong, 45, the triplets' father, said: "It has been a great help that there are three of them because they work off each other and ask each other questions. There is an element of competition as well. We never have to tell them to study." Mr Armstrong, who already pays tuition fees for his son, said he would be working out the cost for the girls.